The inside of a prison is not necessarily the most amenable venue for multiparty talks among warring gang factions, religious figureheads, and an impecunious government. Yet in the Diálogo Nacional por la Paz: El Salvador, 2012 — or, for those of our readers who, like many of our reporters, no son hablantes de español, the National Dialogue for Peace: El Salvador, 2012 committee — this appears to be the ideal setting for such talks. “For the purposes of our committee, the prison setting works perfectly,” explained Chair Gary Castellanos, “as we are dealing with a number of illegal factions who would feel comfortable in such an environment.” Castellanos is hardly exaggerating: many of the committee’s members hail from the rival MS-13 and Barrio-18 gangs. Members of rival gangs critique a crime reduction plan proposed by the Catholic Church. Castellanos explained that, despite their fear-inducing reputation, many of these gang members were among the most vocal supporters of peaceful reform within the country. One member of MS-13 who spoke to Agence France-Presse under strict conditions of anonymity delineated his plan to reintegrate convicted gang members into mainstream society. “Many of these so-called criminals are branded as such for life and can never find respectable employment after serving their sentences even if they wanted to,” he lamented. Other committee members expressed support for similar societally beneficial initiatives. The faction representing the Catholic Church called for a peace treaty between the two competing gangs, claiming that such an agreement would broker a subsequent “reduction in street violence” and “safer neighborhoods across the country.” Delegates also discussed best strategies for increasing the presence of small business in mid- and large-size cities across El Salvador, as many shopkeepers and other merchants have closed their stores due to threats of violence and fear of gang retribution. In additional to gang members and representatives from the Catholic Church, the Diálogo Nacional committee hosts prominent members of the university community — namely the rector of the National University in San Salvador — as well as regional and federal politicians. 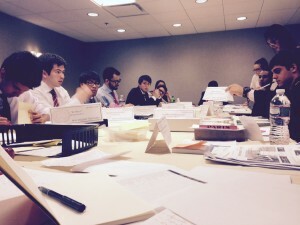 While the committee is infamous for its sinister setting and shady characters, the Diálogo Nacional is equally renowned for its unique operating system: unlike every other committee at Harvard National Model United Nations 2015, it operates exclusively in the Spanish language. “The annual Spanish language committee has a storied history at HNMUN,” explained Castellanos, “although this is the first time I have chaired it.” He defended the use of Spanish within the committee, noting that it brought together delegates from a number of Hispanophone countries — Guatemala, Peru, El Salvador, Spain, Colombia, Venezuela, and Mexico. “The committee has a fun atmosphere, of course, but also a close-knit one: for the last several years, this committee has won the HNMUN service project for charity,” Castellanos claimed. Debate in the Diálogo Nacional committee rages on in the Zacatraz Prison on the fourth floor of the Marriott Boston Copley Place Hotel.